What did Steven Tyler do after his State Fair show? He hit the midway, of course. He even scored a corn dog. When musicians performing on the Grandstand talk about the beauty of the Iowa State Fair, it's just talk, right? When they say they're going to ride the Ferris wheel after the show, they're just working the crowd, no? They don't actually leave their air-conditioned bus to mingle among the fairgoers, do they? Well, when Steven Tyler said at his Grandstand show Saturday night that he was going to get a corndog after his gig, he meant it. The Rock and Roll Hall of Famer gave notice to the rides and illuminated signs just beyond the Grandstand multiple times during his 90-minute set Saturday night, even saying he wanted to hop on some of the rides. "Now you know the second we hit our last song and (I'm) off the stage I'm out on that ride," Tyler told the crowd, pointing to one of the many coasters populating the fair midway, before diving into Aerosmith hit "Jaded." According to multiple posts on Facebook and Twitter, that's exactly what he did. One user shared on Twitter that he saw a photo of Tyler eating a corn dog at the fair and another shared a photo of the act: Tyler being engulfed by fans while enjoying deep-fried food on a stick. Another user commented that he was "literally walking around" the fair. Welp just saw a picture of Steven Tyler eating a corn dog at the Iowa state fair. I only have more questions now. Facebook user William Rodriguez commented on The Des Moines Register's Facebook page with a photo of Tyler waiting in line to ride the Ferris wheel. He said riding at the same time as Tyler was his favorite memory at this year's Fair. Tyler performed at the Grandstand Saturday alongside the Loving Mary Band in support of his new solo record, "We're All Somebody From Somewhere." 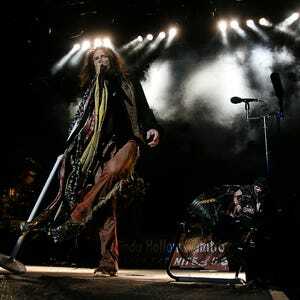 He performed a mixture of classic Aerosmith numbers, new solo cuts and crowd-pleasing covers. The energetic and memorable performance drew 5,437 people to the Grandstand. Lady Antebellum is scheduled to close the 2016 Grandstand performances Sunday night.